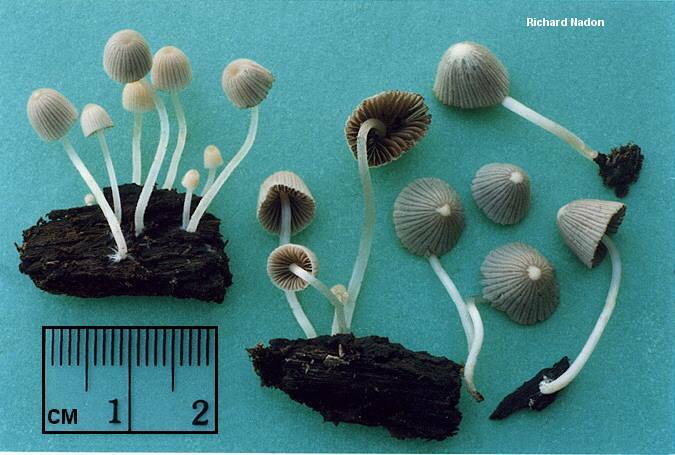 Here is a little coprinoid species whose gills do not turn to black ink; it's even possible to obtain a spore print, rather than a gooey black mass of wet paper (see the illustration below). 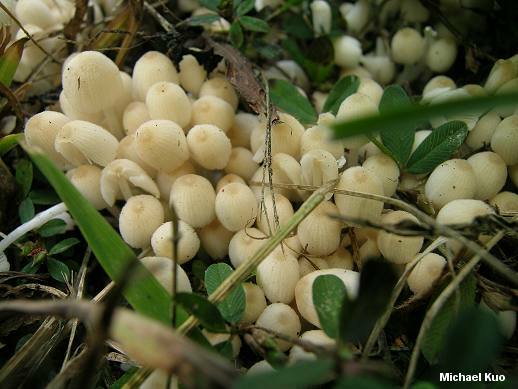 Coprinellus disseminatus typically fruits in clusters near the bases of stumps, sometimes in astounding numbers. 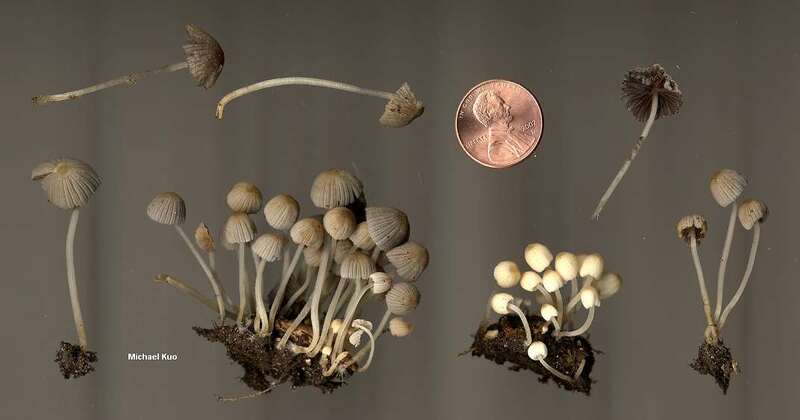 Its cap is initially white, but soon begins to turn grayish brown, with a brownish center. 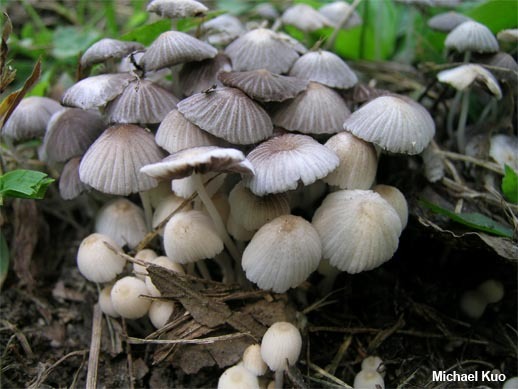 Even though the gills do not turn to ink (the official term in Mycologese is "deliquesce"), Coprinellus disseminatus is still easily recognized as a coprinoid mushroom by its cap shape and grayish black gills. It is an extremely fragile mushroom, and the caps quickly crumble when handled. Pseudocoprinus disseminatus and Coprinus disseminatus are synonyms. 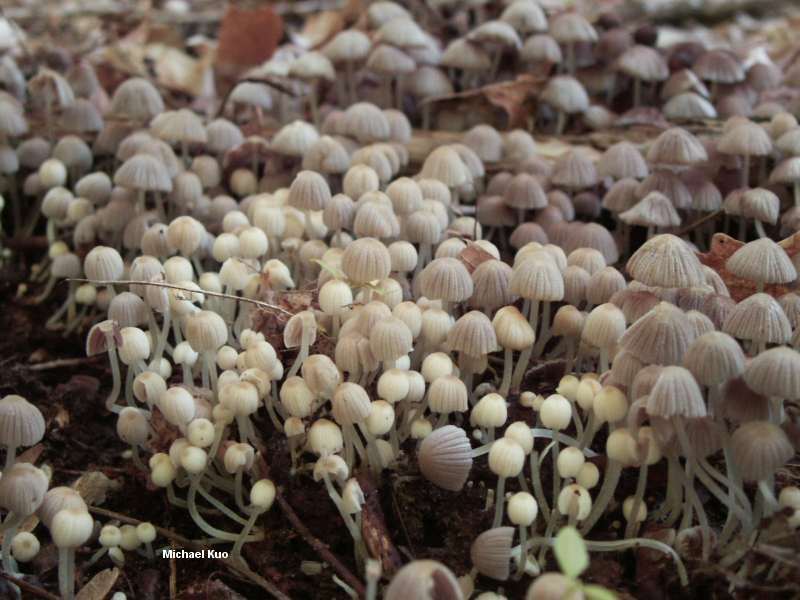 Ecology: Saprobic, growing in clusters, often by the hundreds; on decaying wood, especially near the bases of stumps; spring, summer, and fall; widely distributed in North America. Cap: Minute to 2 cm; oval when young, expanding to broadly convex or bell-shaped; when young almost white, with a brownish center--or grayish--darkening to grayish or grayish brown with a brownish center, paler towards the margin; smooth, or very finely granular/hairy when young; lined or grooved from the margin nearly to the center. Gills: Attached to the stem or free from it; white at first, but soon gray, then blackish; not deliquescing (turning to black "ink"); close or almost distant. Stem: 1.5-4 cm long; 1-2 mm thick; equal; smooth; often curved; white; hollow. Spore Print: Black or blackish brown. Microscopic Features: Spores 6.5-10 x 4-6 µ; elliptical; smooth; with a central pore. Basidia 4-sterigmate, surrounded by 4-6 brachybasidia. Cheilocystidia cylindric, to 70 x 15 «. Pleurocystidia absent. Pileipellis an epithelium with lageniform to subcapitate, thin-walled pileocystidia up to 200 µ long. 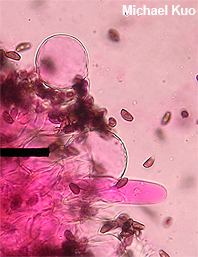 Veil elements as more or less globose sphaerocysts up to 40 µ across. Clamp connections absent. REFERENCES: (Persoon, 1801) J. E. Lange, 1938. (Saccardo, 1887; Smith, 1949; Lange & Smith, 1953; Arora, 1986; Phillips, 1991/2005; Lincoff, 1992; Breitenbach & Kranzlin, 1995; Barron, 1999; Uljé, 2003; Roody, 2003; Keirle et al., 2004; McNeil, 2006; Miller & Miller, 2006.) Herb. Kuo 08289701, 05260306, 09190702.